New: VTA is updating its Long Range Transportation Plan. That will include updating the list of projects included in the plan, which includes transit, local street, highway and bike and pedestrian mobility projects. The final list will be included in Plan Bay Area, the Regional Transportation Plan, through the Metropolitan Transportation Commission (MTC). Project submittals are due to VTA on August 31 and must include a defined budget and a planning study for the capital project. Once submitted, projects will go through an evaluation process before being approved by the VTA Board of Directors for final inclusion in to the plan.​ Download submittal forms and current project lists. The Valley Transportation Plan (VTP) is the countywide long-range transportation plan for Santa Clara County. As the Congestion Management Agency (CMA) for the county, the Santa Clara Valley Transportation Authority (VTA) periodically updates this 25-year plan. 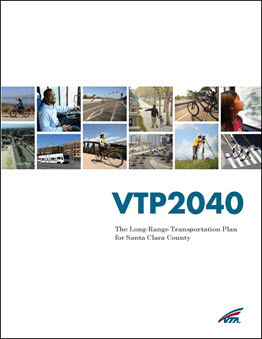 VTP 2040, the most recent plan, adopted by the VTA Board in October 2014, and builds upon the previous plan VTP 2035. The plan highlights the projects and programs that will be pursued in partnership with Member Agencies in the next 25 years. Some of the types of projects being pursued are Complete Streets, Express Lanes, Bus Rapid Transit, and Bicycle/Pedestrian Improvements. VTP 2040 also includes a detailed discussion on planning activities that will take place during the life of the plan. The regional transportation planning process will tie together regional housing needs allocation (RHNA) and regional transportation planning in an effort reduce greenhouse gas emissions in accordance with Senate Bill 375. This legislation requires the region to prepare a Sustainable Communities Strategy as part of its Regional Transportation Plan (RTP), prepared by the Metropolitan Transportation Commission for the Bay Area region, to meet greenhouse gas (GHG) reduction targets set for the years 2020 and 2035. VTA will proactively work with local jurisdictions and the public to develop input that combines both broad land use objectives with transportation policies and projects in its long-range transportation planning efforts.